So I start waiting and watching—and remembering. When my sister, Penny, and I were children, every April we went with our parents down to Lexington, Massachusetts, to stay with our mother’s parents and see the parade on Paul Revere Day (now called Patriots’ Day). The parade was exciting, and our grandparents bought us balloons, but what has stayed with me most are robins. In New Hampshire the weather was still more winter than spring; in Massachusetts forsythia and daffodils bloomed bright yellow and robins were bouncing across the fresh green lawns. At our grandparents’ house, when Penny and I awoke in the mornings the singing of robins was what we heard first. Ever since, when the robins do at last reach New Hampshire and I hear them burbling away first thing in the morning, I’m right back in that Lexington bedroom and a robin is singing outside the window. The same with Penny in Maine. As our father explained to Penny and me, the American robin actually isn’t a robin at all. It’s a thrush. But because of its red breast, homesick colonists named it after the little European robin, who belongs to the flycatcher family. I accepted this bit of knowledge yet only really believed it years later when Don and I were living in England and we actually saw the adorable bird that makes the American robin look as ungainly as a crow. Many years later, Sheena, a friend in Dingwall, Scotland, sent us a Christmas card with a European robin on it. I was so ecstatic about seeing one again that she subsequently sent us Christmas presents of a tray-and-coasters set decorated with robins and then a set of robin doilies. Treasures! In recent years, because of climate change, we have seen an occasional robin in winter. Come spring this year, the robins arrived early, and they were everywhere in our yard. They liked to perch on the wooden stakes marking garden rows, they used the picnic table as an observation platform, and they were very interested in the loam Don spread on a sickly patch of lawn for grass-seed planting. The sound of their “cheer-i-lee” seemed almost constant. We ourselves had a tendency to sing “When the red red robin comes bob-bob-bobbing” a lot. 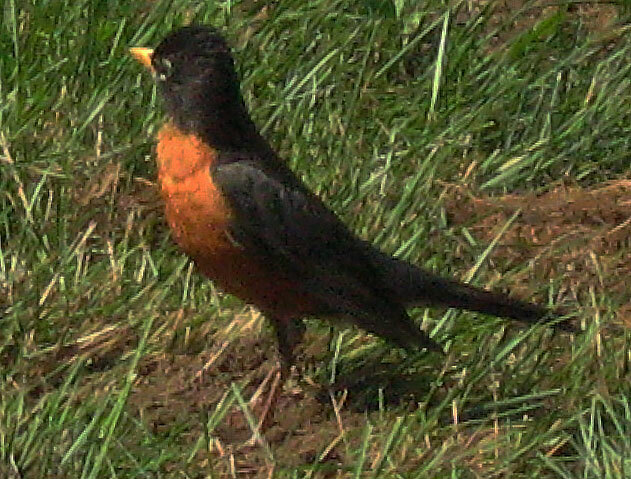 We haven’t read in the news any ornithologist’s report on any extra abundance of robins this summer. So we just have our amateur impression. Now, with the end of summer nearing, the robins have moved on and what we’re hearing most in our yard is the rattling call of the kingfishers as they land in trees and scan the beaver pond for a meal. We assume they’re having better luck than in years past, because the water is lower, giving frogs less cover. For the beaver pond is entering another phase of its cycle. It started out as a small brook bordering our backyard, with woods down to its banks. Then the beavers moved in, building a dam that Don estimated to be longer than a football field, which created a string of four ponds. One of the lodges can be cozily seen from our kitchen windows and back porch. During the next twenty years, “Nature’s engineers” cut down most of the deciduous trees within beaver-traveling distance. (See my Neighborhood essay, “The End of Our Rope,” about how their efforts even included our clothesline.) Last year they realized they’d eaten themselves out of house and home, and they left. Without their maintenance of the dam, the pond is draining away. According to what I’ve read about the cycle, the pond will become a meadow, in which saplings will eventually grow, and someday the beavers will return and cut down the new trees for sustenance and material to repair the dam . . .
We miss the beavers. A muskrat has taken over the lodge. We’ve named him Jerry Muskrat a la Mother West Wind, and we watch him swimming along, dragging a little leafy branch into the lodge through the beavers’ old entrance, but it’s not the same. In early spring we’d begun bringing in the birdfeeders at night but we couldn’t yet make ourselves bring them in during the daytime and give up the pleasure of watching the birds. What, not see birds on the feeders until the bears were hibernating again?! We procrastinated, as usual. So one evening in May, just as Don was washing the supper dishes before going outdoors to bring in the feeders, he looked out the kitchen window and saw a bear suddenly there, a few feet away, knocking over the birdfeeder pole. I eeked. Don ran out to the porch. He had prepared for bears this year by buying a new weapon with which to make noise, instead of the deafening old brass dinner bell my mother had rung to call my father in from the north forty in their farming days. On the porch, waiting for just this moment, was his purchase, an air horn, alongside his ear protectors. He donned (sorry, can’t resist that pun) the latter and began blasting away. The air horn was far more than deafening. It was painful. I of course wasn’t wearing ear protectors and leapt out of my skin. The bear took off partway into the woods and then paused to consider returning. Don blasted some more, and the bear skedaddled for good. We sadly brought the feeders indoors and put them away until late fall or early winter, however long we can wait. The other wildlife sighting: In June, at about six in the morning, I glanced up from the kitchen sink and saw the backyard filled with a moose, very black-looking in the wet green morning. He meandered on to the beaver pond and partly waded, partly swam across to the opposite bank and continued his leisurely way up the slope into the woods. We could clearly watch his progress because the beavers had cleaned out all the trees except the pines up to the top of the slope. One creature we looked for throughout the summer was one we had seen for the first time in our lives a year ago. On a June evening we’d heard the strangest sound, a mechanical noise like great gulping. I said, “It’s the sump pump strangling!” Don patiently explained that it wasn’t coming from the vicinity of the sump pump in the cellar. It was coming from outdoors, from the swampy part of the beaver pond. But we couldn’t see what on earth it was. So I decided it must be the Creature from the Black Lagoon. A couple of days later we heard the noise again and scanned the pond—and Don, with a chill, saw a face looking back at him from the swamp. A bird face. A very peculiar bird face. By the time he pointed for me to look, it was gone. Other books described the noise as “booming” or “belching.” We’d heard a bittern belch! The next evening, after supper, we heard that sound again. A large bird flew off from the pond, not as big as a heron but bigger than a duck. A bittern! Then the sound came again from that same spot. There must be two of them, courting. Don walked stealthily across the lawn, studied the scene, beckoned to me. I tiptoed to join him. The bird looked slim, brown-yellowish. It was in profile to us. And then we saw it begin opening its beak. The gulping sound echoed across the pond. Alas, that was the last time we saw or heard the bitterns last summer. And we never saw or heard them this summer. But we sure did see and hear robins.